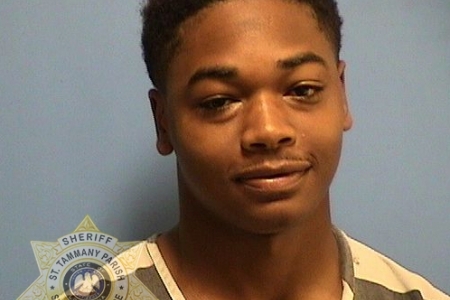 The St. Tammany Parish Sheriff’s Office is looking for a second suspect after a 19-year-old was robbed at gunpoint in a rural area of Folsom, LA on Tuesday evening (April 9). The victim had made plans to meet up with an acquaintance, who he identified as Cameron Perry (DOB 4/18/2000) of Folsom, so the two could shoot guns. While the two were at the arranged location, a third individual got out of Perry’s vehicle holding a handgun and approached the victim. After robbing the victim of two firearms, Perry and the unidentified man left in Perry’s Dodge Charger. At approximately 10:30 p.m. Tuesday, STPSO detectives located the vehicle in Covington, and Perry was taken into custody without incident. At the time of his arrest, Perry was found to be in possession of Xanax and marijuana. As part of the ongoing investigation, a search warrant was executed Wednesday at a Covington-area residence. The guns taken during the robbery and the gun believed to have been used in the robbery were all located and subsequently recovered at that residence. Anyone with information about this crime or the identity of the second individual involved is asked to call Detective Ben Williams at (985) 726-7855 or (985) 898-2338.